Four out of four walls are windows. Three sliding glass doors. Sounds barrage within and without. The teenager next door is coughing and playing video games. It’s 3:30am. The tiny baby on the other side alarms again and again. Nurses at their computers just outside, chat and laugh. Who decided the little key code lock for the med cabinet needed to produce a sound with each button pressed? The Purell dispenser…is that an abbreviated sound of a chain saw or weed whacker? Pumps alarm. Releasing the blood pressure cuff from the arm scratches the air; ragged. Paper and plastic crackle the night. Swish of the isolation gown with every movement. New med, program the pump. The beeping of buttons baffles. Why? Why must every thing beep?!!! Auditory assault. Breathes come sixty, seventy times a minute and with each the rhythmic moan or is it a whine, perhaps a grunt? Her arms swing out wide, straight up into the air and eyes flash unseeing. “I thought a glass bowl was falling,” she exclaims and her eyes shut again almost immediately. Back to the grunt whine moan. I push off the blanket and then pull it this way. I roll to face the wall, seeking refuge from the incessant sounds. But I know, I know if I sleep on this shoulder I will wake with a headache. Too hot I think. Turn down the thermostat and reinstall the earplugs and eye mask. There’s something unnatural about sleeping in the presence of someone bustling about, mere feet from their activity while you strive to enter that state of finally letting go of the details of the present. I lay there and my mind goes straight like little magnets to those endless numbers. What is her CRP (measure of inflammation)? Her BNP (measure of heart distress) went down from 2350 to 1200 something to 950 ish. When are labs? What time is it? A normal BNP would be 0-90. Labs are back and her’s has bumped up to 1700. Alarms blare and I whip on my glasses and study the monitor. Oxygen saturation is 88 now 87, 86. Is the pulsox on correctly? Try a different toe, a finger maybe? And I look up at the top green number flashing in the 170s. How is her heart ever going to heal if it will never slow, never ease? What will the Heart Failure team say about that BNP that’s dropped? I despise that name, Heart Failure. Can’t they think of a more positive name for their team? Stuff the earplugs down tight and slowly, eventually enter that place where consciousness drops away and maybe the numbers can’t sneak in through the cracks. Her breathing picks up and she calls out panicked, “I’m gonna throw up!” With speed and attempted gentleness I thrust her back upright, hand pressed against her back hot and soft. I pull her into the crook of my arm, holding the throw-up basin with one hand and the other wraps around to the left stroking her arm. My face rests atop the heat of her cranium spiky and soft from one lone hair left here and there. All my cells cry out for sleep and I tell them to hush as she gags and strains. Over and over I rise to comfort her and cycle back round seeking reprieve in sleep for myself. Three broken hours of sleep and my alarm declares morn at 6:30 which happens to coincide with the unexpected swoosh of three gown clad surgeons here to assess their wee patient. I am flustered at how flustered I was with the night. But it’s like the movie “Groundhogs Day,” where you simply relive the same day over and over, some endless cycle you cannot seem to escape. I feel a bit crazed. In rounds all her “systems” are discussed and once again the suggestion of doing another CT comes up and I resist. My mind has had hours and hours to review her episodes of pain, look for the details, clustering and dissecting. I hover over these now 10 days in the ICU, contemplating, considering each angle. Here’s what I got – Days 1 – 3 her pain fairly steadily decreased. However, with the first dose of granulocytes, her pain once again ramped up with episodes of intense pain that required boluses of pain meds to even bring moderate relief. The fevers began, sometimes a whole day at a time with unbroken fever despite Tylenol. Other days the fevers were intermittent. In the past few days, while the fevers have continued, the boughts of intense pain have reduced in frequency. More often now, if she has an episode of intense pain it yields gas, throw up or most often, stool. From my vantage point, she is no longer having generalized episodes of intense pain but rather a simmering incessant discomfort and agitation. She never seems to really sleep. She startles and whimpers constantly in her sleep and breathes rapid, shallow breaths. The idea of needing a CT is once again tabled, at least for today. For the first time I hear the term ICU delirium, but the conversation rushes on before I get a hold of this word and whether it was meant in jest or truth. Uh, what? What in the world does that mean? She gets herself SO worked up. She hears the resident say she’s going to order a chest X-ray and she begins amping up her terror. The sight of the portable X-ray outside the door only intensifies her fears and agitation. When the X-ray plate is slid behind her back she screams, literally screams with mouth wide, Owie, Owie, Owie!!! She is becoming more and more irrational. Before the nurse even flushes her IV she assumes it will hurt and pulls back. So I don’t really understand the first thing about it, oh wait, no I do. I do understand the first thing about ICU Delirium. I’ve started to experience it myself and I’m not even the one in pain and sick. Allistaire has hardly had a solid hour of good peaceful sleep in the last 10 days. The number of intrusions on her body is literally incalculable. Apparently this phenomenon is legitimate where the brain, so deprived of sleep and so disoriented by medications and interruptions literally loses its hold on reality. I have seriously no idea what she means that her face might fall of the ceiling. But the poor girl is coming undone. We are all trying to assess what is real and true for Allistaire and how to meet her needs most effectively. And by “we,” I mean her nurse, the ICU attending, the fellow, the resident, the Infectious Disease Team, the Heart Failure Team, the Hematology/Oncology Team, the surgeons, the pharmacist, the nutritionist and of course myself. Throw in the mix the sweet music therapist, Betsy, the art therapist, Rosalee, and the occupational and physical therapist – all of whom, literally all of whom, have seen her today and do most days. Every single day her meds are assessed as are her fluids in and out and her pain. Every single day her blood counts, electrolytes, cardiac function, liver function and kidney function are examined. Her blood pressure, temperature, respiration and saturation are tested, endlessly it feels, over the course of each day and night. A fever brings need for temperature checks every 15 minutes. Conversation after conversation re-addresses each topic with fine tooth comb, looking for clues, for missed signs, for hope and for doom. I am exhausted and maybe more so, just weary of it. More so is she. So what are we to do? We’ve requested we be moved to the 6th Floor PICU in Forest where the rooms are identical to our room one floor up on the cancer unit. These rooms offer such amenities as 2 solid walls, one window to the outside and a sliding glass door that actually closes all the way. There is a curtain that more effectively blocks out the saturating light of the hallway and a second curtain that provides a small bit of privacy for the parent. Another handy joy is a bathroom you can use in your own room, rather than the current scenario of having to put on your shoes walk through two sets of doors and then around the hall and a request to be let back in. So not only would a room on the Forest PICU offer more quiet and dark, but it would be familiar, it would look just like home. And maybe these little details would help my little love return to reality and herself a bit. In an effort to ease the burden on her heart, her fluid balance is reassessed numerous times a day in an attempt to determine if she needs more Lasix to pull off fluid. So while Allistaire is a bit crazed, in some pain and breathing a little inefficiently, the major issue that’s risen to the top is the condition of her heart. While it is still not ultimately clear if the fevers and pain can be decisively linked to the actions of the granulocytes, it seems likely that her typhlitis is on the mend and will really have the best chance to do so once her marrow starts to produce its own white blood cells. Today is day eleven since her ANC hit zero. In the last round of chemo, it took fourteen days at zero before her marrow started to rebound and begin producing cells. It may take longer this time since her marrow had already been knocked down hard so recently. On the other hand, the GCSF shots which she gets each evening, may speed up her blood count recovery. Regardless, while the granulocyte transfusions are likely helping her heal, the real progress will be seen once her marrow recovers. As far as I understand, the condition of her heart is being assessed clinically, and by the echocardiogram and her BNP (Brain Natriuretic Peptide). To assess her heart clinically, the team listens to her heart with the stethoscope, feels pulses and assesses profusion by feeling if her hands and feet are warm and if they have good capillary refill. 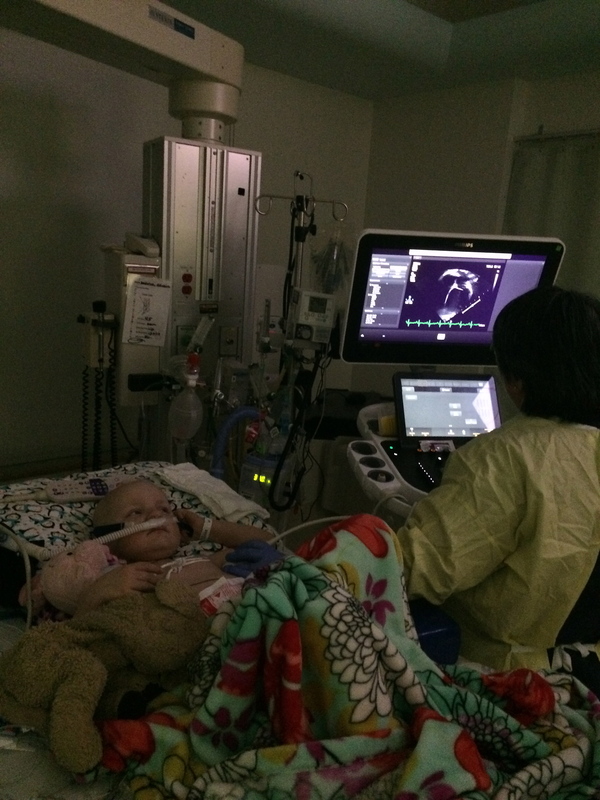 Her echocardiogram provides the cardiologists with a lot of information like whether or not the heart is dilated and what the ejection and shortening fractions are. After her last round of chemo, her heart looked awesome with an ejection fraction of 65 and a shortening fraction of 32. Her last two echocardiograms which she’s had during this ICU stay, have both showed a substantial drop in heart function with her ejection fraction down to 28 and her shortening fraction at 18. Not only was she put back on the Milrinone, but the dose was doubled. Apparently, Milrinone is an excellent heart med but one that can only be given in the setting of the ICU. It is likely that the cardiologists will want another echocardiogram sometime in the next several days which would help them to decide what to do with the dosing of the Milrinone. The timing of this will probably be informed by how her BNP is trending. Normal is 0-90 and at first testing four days ago, hers was 2350. It then dropped quite nicely for three days but is now back up. We will see what the next few days bring. Of course our great hope is that this is an acute process that just needs more time to resolve, but resolve it will. I had intended to give this update on transplant after a great phone call on Friday the 16th, but this whole ICU business sort of took the spotlight. Back when all my attention was focused on those doors preceding transplant, a few conversations here and there brought wonderful news. Dr. Bleakley, the transplant doctor at Fred Hutch who is heading up the clinical trial we so hope for Allistaire to be on, has gained the consent approval of the German version of the FDA along with the go ahead from the FDA itself. Apparently, if you don’t hear anything from the FDA in the 30 days from your request, you are free to proceed. Two great doors have swung open. The other issue with the transplant was the question of whether or not the cells would be viable once they arrived in Seattle to undergo the naive T-cell depletion which is what makes this transplant unique from the standard protocol. Knowing that it was possible the cells would not last long enough to undergo this manipulation, it was possible that the cells might simply be transfused as is done in a standard transplant. The standard transplant and clinical trial transplant have different conditioning chemos. The standard transplant uses Cytoxin and the trial uses Fludarabine. Fludarabine is the first chemo that Allistaire had with her first relapse. The Fludarabine didn’t even touch her leukemia. So my fear was that if we chose to go forward with the clinical trial transplant and the cells were unable to undergo the manipulating, we would have essence chosen a transplant with Fludarabine over Cytoxin, knowing Fludarabine hasn’t destroyed her leukemia in the past. I was relieved to hear that the purpose of the conditioning chemo is not for its anti-leukemic effect, but to suppress the host (Allistaire) immune system enough to make way for the donor cells. Turns out Cytoxin isn’t especially anti-leukemic for AML either and is again simply being used to suppress her immune system so that it doesn’t attack and destroy the donor cells before they can get established in her body. This means that while the chemos differ for conditioning, their purpose and effectiveness are on parr. Additionally, Dr. Bleakley is now taking a more positive stance on the idea that the cells will be in good enough condition to undergo the naive T-cell depletion. Her optimism is likely impacted by now knowing who exactly her donor is and thus where exactly they are coming from. A donor from a “major center,” like Frankfurt would allow for a quicker turn around time than a donor from some small town or country outside of a major transportation hub. So who is Allistaire’s donor? Oh how my heart leapt with joy when I heard that there is a 28-year-old woman who is O positive and CMV positive that has committed to the requested time frame for transplant. She’s real! It’s so hard to fathom, to really get a hold of, but she’s out there and she’s Allistaire’s hope for a source of blood cells devoid of disease and replete with life. Day +28 of this round of chemo is February 5th and she is currently scheduled to be transferred to the BMT (Bone Marrow Transplant) service on February 17th. Assuming the standard 2 week testing period, conditioning would start on about March 3rd with about four days of radiation followed by 2-3 days of chemo. The actual transplant would therefore occur about March 10th. Of course this is all dependent on her ability to recover from this acute assault on her heart and gut and be in a position to move forward with transplant. My eye is ever on every last detail of the present and simultaneously it is fixed on that ultimate goal of transplant. Perhaps this adds to why I feel slightly crazed myself, the stakes are high, as high as they can get really. The last update on transplant is that apparently the awesome law passed in Montana almost exactly two years ago which was supposed to bar insurance companies from denying cancer patients clinical trials, is according to the financial counselor, “swiss cheese.” The insurance companies have found the loop holes and do what they can to avoid having to incur costs. Kira, the SCCA (Seattle Cancer Care Alliance) insurance coordinator tells me that while the insurance companies have their way to get around things, so do the SCCA lawyers. Nevertheless, Kira, our financial counselor Carrie and our social worker Ashlei are all working any angle they can to ensure that Allistaire’s transplant gets paid for. Currently we are applying for some sort of spend down Montana Medicaid program and Montana Social Security for Allistaire. I will spare the details but the final word from Carrie is that if all else fails, Seattle Children’s Hospital will pay for Allistaire’s transplant through their foundation. I could not help but cry when she told me that. How utterly incredible that ultimately we need not stress over how this transplant will be paid for. Of course it is my hope that insurance or Medicaid will cover the cost but it is such a relief to know that one way or another, cost will not be a blockade. So, so many details. So many facets of an ever-changing picture to constantly be reassessing. Right now so much of what is before us is simply endurance, simply being patient with the need for time to accumulate. We live ever in a state of delayed gratification, ever pressing on because at the core, we believe it will be worth it. On the other side of this is something worth enduring for, really, worth suffering for. This seems to be one of the major themes God continues to impress upon my heart – endure for the joy set before you. Endure. Joy is coming. JOY IS COMING! Endure. And there is my sweet Christ, my compassionate, merciful high priest, yielding before the God of the universe, taking Him at His word. Christ endured the cross for the joy set before Him. I seek to endure these days because I am looking ahead. I fix my eyes on Christ, the author and perfecter of my faith. And all the while, I know that He sees me and He is carrying me, even through ICU Delirium. Praying for some much needed rest for you both. Peace to you both. Comfort for her little precious body. Hoping for a room change. Any small comfort. My heart breaks for all you two are enduring together. I’m always in awe of the words the Lord gives to you and your ability to convey such complicated medical scenarios to simple minded readers. We continually holds you, Allistaire and your family in our prayers. Indeed we count them blessed who endure. You have heard of the perseverance of Job and seem the end intended by the Lord-that the Lord is very compassionate and merciful. You are stronger and more resilient than you may believe possible….after all, God did create you (and all humans) in HIS image. Be strong, be brave, seek joy in the impossible and peace in the moment. God knows what you are going through, may you feel wrapped in HIS unending love! Woke up at 3:15 and checked your post. I pray you all move soon to picu. May God give you both rest and peace. May her heart beat strong and not be over worked any more. Help the doctors and Jai discern what is needed next. Hold them close, Jesus. Hoping you both get much needed sleep and peace. Carrying you and Allistaire in my heart and prayers. Wishing you both peace for your minds and bodies! Prayers, always prayers . . .
Dear Jai and Sten, I recently finished reading the book BONHOEFFER, Pastor, Martyr, Spy, by Eric Metaxas. Here is a quote about Dietrich Bonhoeffer who was nearing execution by hanging for his part in the conspiracy to kill Hitler. Payne Best wrote: “His soul really shone in the dark desperation of our prison. [Bonhoeffer] had always been afraid that he would not be strong enough to stand such a test but now he knew there was nothing in this life of which one need ever be afraid.” Bonhoeffer was 39 years old at the time. Like you, he chose to trust God, with circumstances beyond my comprehension, because of his firm belief that the pain and suffering he endured would be worth it. May God comfort you and keep your hearts and minds stayed on Him as you endure the suffering that will lead to joy eternal. Come quickly, Lord Jesus! As I read your most recent post this week, a sweet friend of ours from here in Oregon headed up to Seattle Children’s Hospital and the Ronald McDonald House with her tiny infant who is preparing for a transplant. I thought of you, knowing that the two of you have your hands and time full with your little ones, but also imagining what a blessing you two could be to each other if you ever were to happen to meet. I told her family about you and gave them your name. In case you run into her or hear from her, her name is Anna Edmonds. Maybe the Lord will orchestrate a way for you two to encourage each other. Thank you for sharing Allistaire’s birthday with us this week, for sharing the ups and downs, for sharing your real and raw faith. It has become such a part of my life and a great privilege to pray for Allistaire and your family.